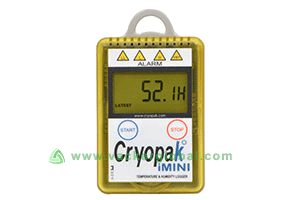 Humidity and Temperature Data Loggers manufactured by Cryopak USA have wide variety of models for different range of temperature and humidity and different memory ranges. One of the major uses of these data loggers are for health care logistics. There are numerous models with internal and external sensors for temperature. 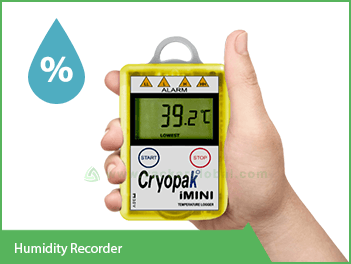 iMini series is the most popular and economic series of Data Loggers. iMini series has two range of products viz. Temperature Data Loggers and Temperature + Humidity data loggers. It has a memory capacity of 16000 readings to 128000 readings. Temperature Sensor type is Internal and there are other models with external sensors. Humidity Sensor type is internal only. There are 4 programmable visual alarms viz. 2 on the higher side and 2 on the lower side. Alarms are Indicated by LED of different colours. It is programmable sampling interval from 5 seconds to 17 hours. Temperature measurement range is form -40 °C to +80 °C (-40 °F to +176 °F). For application such as refrigerators, a glycol bottle can be used optionally to reduce sudden fluctuations due to frequent door openings. We offer a warranty period of 2 years against manufacturing defects, except for battery. 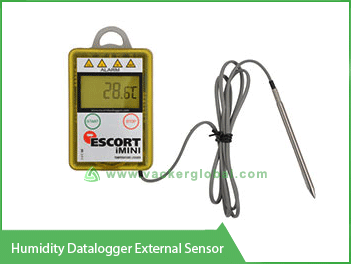 This model is Temperature and Humidity Multi-use data logger with external sensor. There are 3 sensors viz. 2 Internal sensor & 1 External senor (1 no internal temperature sensor, 1 no. external temperature sensor, 1 no. internal humidity senor). Type of sensors is Digital sensor and NTC. This Temperature and Humidity Multi-use data logger is with internal sensors. This model has 2 nos. sensors viz. 1 no internal temperature sensor and 1 no. internal humidity sensor. Type of sensors are digital sensors. Memory capacity is 16000 readings (higher models with capacity upto 128,000 readings are available). The LCD display has capability to view different functions. Visual and audible alarms are available. It has the capability to bookmark times. Different models are available for very wide temperature range of measurement. It has an accuracy of ±0.35 °C. Detachable, customizable external sensor lengths and probe styles are available in different models. This is one model of Temperature and Humidity Multi-use data logger under iLog series. Measuring range is from -40 to +70°C (-40 to +158 °F). This model has 2 nos sensors viz 1 no internal temperature sensor and 1 no. internal humidity sensor. LCD Operating Range is form -20 °C to +70 °C (-4 °F to +158 °F). Sampling Interval is from 5 seconds to 10 days. It has a resolution of 0.1 °C / 0.1 °F / 0.1%. Battery Life is 1-2 years (depending on usage). It can connect to an external audible alarm.